Alongside the launching ceremony for the “Pietro Venuti” submarine, the third unit of the four U212A “Todaro” class twin units ordered to Fincantieri by the Central Unit for Naval Armament – NAVARM for the Italian Navy, an important agreement for naval vessels sector was signed between Fincantieri and Finmeccanica, aiming at increasing competitiveness on national and international markets, through a more efficient and effective integrated offer by the two Companies. In particular, this collaboration will develop taking advantage of the technical and commercial synergies between the Naval Vessels Business Unit in Fincantieri and Finmeccanica Group companies (the subsidiaries Selex ES, Oto Melara, WASS and the joint venture MBDA), benefitting from their knowledge in combat naval systems, electronics and surface and underwater warfare systems. Knowing that, by tradition, Navies prefer direct relations with the shipyard, Fincantieri will act as the only interface with the client, being thus able to appraise the entire offer of Finmeccanica naval products. This agreement also envisages a collaboration on research and innovation activities, to maximize market positioning and to rationalize investments, even through the promotion of joint studies in the common sectors. Fincantieri and Finmeccanica will analyze the opportunity of creating a common net of suppliers for base products and components, in order to achieve proper synergies and develop the technological excellences of Italian small and medium-sized enterprises, fostering their growth both in terms of size and as regards their scientific and quality development of the product. 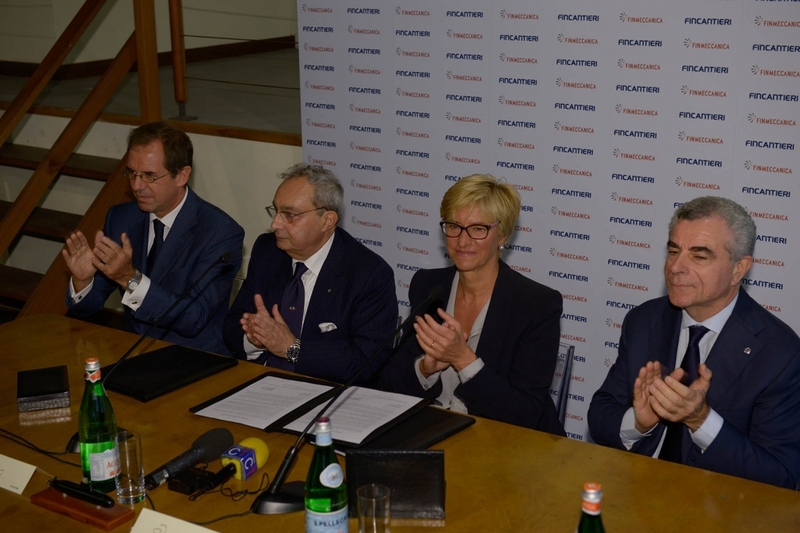 Fincantieri’s Chief Executive Officer Giuseppe Bono commented: “Today is an extraordinary day for Fincantieri, for the Defence industry and for the Italian industry in general. The agreement with Finmeccanica is a tangible evidence towards the achievement of that “economic and industrial system” craved for so long, which is currently indispensable to strengthen the national economy. This agreement deals with the promotion by the product “ship” to all components fitted on board: we aim at defining a truly integrated industrial system, based on a business volume of over 1.5 billion euro per year and thus similar in size to the main international competitors”. Bono concluded: “No better seal than the “Venuti” could confirm this result. The state of the art submarine launched today is the fruit of the cooperation of the major Italian companies in this sector and of Fincantieri Group’s continuous investment in research and development. It provides additional evidence of the skills and knowledge we bring to the table in the most technologically-advanced sectors of shipbuilding”. Mauro Moretti, Chief Executive Officer and General Manager of Finmeccanica, said “Today’s agreement, in addition to making the collaboration between two Italian industries of historical significance to the naval sector more effective, represents an important opportunity to strengthen the global position of technological excellence of the two Groups. Finmeccanica will provide the skills, products and technologies in combat, weapons and surveillance systems, with the aim of offering an integrated and competitive range of products capable of fully meeting a wide variety of customer requirements. The submarine launched today, which integrates some of the most advanced WASS systems, is another strong example of the already profitable collaboration between Fincantieri and Finmeccanica”.